Frances Perkins (born Fannie Coralie Perkins; April 10, 1880 – May 14, 1965) was an American sociologist and workers-rights advocate who served as the U.S. Secretary of Labor from 1933 to 1945, the longest serving in that position, and the first woman appointed to the U.S. Cabinet. As a loyal supporter of her friend, Franklin D. Roosevelt, she helped pull the labor movement into the New Deal coalition. She and Interior Secretary Harold L. Ickes were the only original members of the Roosevelt cabinet to remain in office for his entire presidency. During her term as Secretary of Labor, Perkins executed many aspects of the New Deal, including the Civilian Conservation Corps, the Public Works Administration and its successor the Federal Works Agency, and the labor portion of the National Industrial Recovery Act. With the Social Security Act she established unemployment benefits, pensions for the many uncovered elderly Americans, and welfare for the poorest Americans. She pushed to reduce workplace accidents and helped craft laws against child labor. Through the Fair Labor Standards Act, she established the first minimum wage and overtime laws for American workers, and defined the standard forty-hour work week. She formed governmental policy for working with labor unions and helped to alleviate strikes by way of the United States Conciliation Service. Perkins dealt with many labor questions during World War II, when skilled labor was vital and women were moving into formerly male jobs. Fannie Coralie Perkins was born in Boston, Massachusetts, to Susan Bean Perkins (4 September 1849 – 1927) and Frederick W. Perkins (24 August 1844 – 1916), the owner of a stationer's business (both of her parents originally were from Maine). Fannie Perkins had one sister, Ethel Perkins Harrington (1884-1965). The family could trace their roots to colonial America, and the women had a tradition of work in education. She spent much of her childhood in Worcester, Massachusetts. Frederick loved Greek literature, and passed that love on to Fannie. Perkins attended the Classical High School in Worcester. She graduated from Mount Holyoke College with a Bachelor of Arts degree in chemistry and physics in 1902. While attending Mount Holyoke, Perkins discovered progressive politics and the suffrage movement. She was also named class president. After college, she held a variety of teaching positions including a position teaching chemistry from 1904 to 1906 at Ferry Hall School (now Lake Forest Academy), an all girls school in Lake Forest, Illinois. In Chicago, she volunteered at settlement houses, including Hull House where she worked with Jane Addams. She changed her name from Fannie to Frances when she joined the Episcopal church in 1905. In 1907, she moved to Philadelphia and enrolled at University of Pennsylvania's Wharton School to learn economics. After two years in Philadelphia, Perkins moved to Greenwich Village, where she attended Columbia University and became active in the suffrage movement. In support of the suffrage movement, Perkins attending protests, meetings, advocated for the cause on street corners. She obtained a master's degree in political science from Columbia in 1910. She achieved statewide prominence as head of the New York Consumers League in 1910 and lobbied with vigor for better working hours and conditions. Perkins also taught as a professor of sociology at Adelphi College. The next year, she witnessed the tragic Triangle Shirtwaist Factory fire, a pivotal event in her life. The factory employed hundreds of workers, mostly young women, but lacked fire escapes. When the building caught fire, many workers tried unsuccessfully to escape through the windows.Just a year before these same women and girls had fought for and won the 54 hour work week and other benefits that Perkins had championed. One hundred forty-six workers died. It was because of this fire Frances Perkins would leave her office at the New York Consumers League and, on the recommendation of Theodore Roosevelt, become the executive secretary for the Committee on Safety of the City of New York. In 1913, Perkins was instrumental in getting New York to pass a "fifty-four-hour" bill capping the number of hours women could work. Perkins pressed for votes for the legislation, encouraging proponents including legislator Franklin Delano Roosevelt to filibuster while Perkins called state senators to make sure they could be present for the final vote. In 1912, Perkins resigned as New York secretary of the Consumers League to take the position of executive secretary with the Committee on Safety. The Committee on Safety was formed to increase fire safety following the Triangle Shirtwaist Factory Fire. As part of the Committee on Safety, Perkins investigated the fire at the Freeman plant in Birmingham, New York in which 63 people died. Perkins blamed lax legislation or the loss. In 1913, Perkins married New York economist Paul Caldwell Wilson. She kept her maiden name because she did not want her activities in Albany to affect her husband, then the secretary to the New York City mayor. She defended her right to keep her maiden name in court. The couple had a daughter, Susanna, born in December 1916. Less than two years later, Wilson began to show signs of mental illness. He would be frequently institutionalized for mental illness for the remainder of their marriage. Perkins had retreated from public life following the birth of her daughter, but returned after her husband's illness in order to provide for her family. According to biographer Kirstin Downey, Susanna displayed "manic-depressive symptoms," as well. Perkins privately had a romantic relationship with Mary Harriman Rumsey, founder of The Junior League. The women lived together in Washington, D.C. until Rumsey's death in 1934. Prior to moving to Washington, D.C., Perkins held various positions in the New York State government. She had gained respect from the political leaders in the state of New York. In 1919, she was added to the Industrial Commission of the State of New York by Governor Al Smith. Her nomination was met with protests from both manufacturers and labor, neither of whom felt Perkins represented their interests. Smith stood by Perkins as someone who could be a voice for women and girls in the workforce and for her work on the Wagner Factory Investigating Committee. Although claimed a delay in Perkins' confirmation was not due to her being a woman, some state senators pointed to Perkins not taking her husband's name as a sign that she was a radical. Perkins was confirmed on February 18, 1919 becoming one of the first female commissioners in New York, and she began working out of New York City. The state senate confirmed position made Perkins one of three commissioners overseeing the industrial code and was the supervisor of both the bureau of information and statistics and the bureau of mediation and arbitration. The position also came with an $8,000 salary, making Perkins the highest paid woman in New York state government. Six months into her job, her fellow Commissioner James M. Lynch called Perkin's contributions "invaluable," and added "[f]rom the work which Miss Perkins has accomplished I am convinced that more women ought to be placed in high positions throughout the state departments. In 1929 the newly elected New York governor, Franklin Roosevelt, appointed Perkins as the inaugural New York State industrial commissioner. As commissioner, Perkins supervised an agency with 1,800 employees. Having earned the co-operation and the respect of various political factions, Perkins ably helped put New York in the forefront of progressive reform. She expanded factory investigations, reduced the workweek for women to 48 hours and championed minimum wage and unemployment insurance laws. She worked vigorously to put an end to child labor and to provide safety for women workers. In 1933, Roosevelt nominated Perkins as Secretary of Labor. The nomination was met with support from the National League of Women Voters and the Women's Party. The American Federation of Labor criticized the selection of Perkins because of a perceived lack of ties to labor. As Secretary, Perkins oversaw the Department of Labor, Perkins went on to hold the position for twelve years, longer than any other Secretary of Labor. She became the first woman to hold a cabinet position in the United States and thus became the first woman to enter the presidential line of succession. The selection of a woman to the cabinet had been rumored in the four previous administrations, with Roosevelt being the first to follow through. Roosevelt had witnessed Perkin's work first hand during their time in Albany. With few exceptions, President Roosevelt consistently supported the goals and programs of Secretary Perkins. As Secretary of Labor, Perkins played a key role in the cabinet by writing New Deal legislation, including minimum-wage laws. Her most important contribution, however, came in 1934 as chairwoman of the President's Committee on Economic Security (CES). In this post, she was involved in all aspects of the reports, including her hand in the creation of the Civilian Conservation Corps and the She-She-She Camps. Perkins also drafted the Social Security Act of 1935. On the day the bill was signed into law, her husband escaped from a mental institution. With the death of President Roosevelt, Harry Truman ascended to the office on April 12, 1945. Truman chose his own cabinet, including Lewis B. Schwellenbach as Secretary of Labor. Perkins' tenure as Secretary ended on June 30, 1945 with the swearing in of Schwellenbach. Following her tenure as Secretary of Labor, in 1945 Perkins was asked by President Truman to serve on the United States Civil Service Commission. In her post as commissioner, Perkins spoke out against government officials requiring secretaries and stenographers to be easy on the eyes, blaming the practice for the shortage of secretaries and stenographers in the government. Perkins left the Civil Service Commission in 1952, when her husband died. During this period, she also published a memoir of her time in FDR's administration called The Roosevelt I Knew (1946, ISBN 9780143106418) which covered her personal history with Franklin Roosevelt, starting from their meeting in 1910. Following her government service career, Perkins remained active as a teacher and lecturer at the New York State School of Industrial and Labor Relations at Cornell University until her death in 1965 at age 85. She also gave guest lectures at other universities, including two 15-lecture series at the University of Illinois Institute of Labor and Industrial relations in 1955 and 1958. At Cornell she lived at the Telluride House where she was one of the intellectual community's first female members. Kirstin Downey, author of The Woman Behind the New Deal: The Life of Frances Perkins, FDR's Secretary of Labor and His Moral Conscience, dubbed her time at the Telluride House "probably the happiest phase of her life". She is buried in the Glidden Cemetery in Newcastle, Maine. Perkins would have been famous simply by being the first woman cabinet member, but her legacy stems from her additional accomplishments. She was largely responsible for the U.S. adoption of social security, unemployment insurance, federal laws regulating child labor, and adoption of the federal minimum wage. The liturgical calendar of the Episcopal Church honors Perkins with a feast day on May 13. She was the winner of the "Golden Halo" in Lent Madness 2013, an educational tool hosted by Forward Movement Publications featuring the saints of the calendar of the Episcopal Church. In 1967, the Telluride House and Cornell University's School of Industrial and Labor Relations established the Frances Perkins Memorial Fellowship. In 1982, Perkins was inducted into the National Women's Hall of Fame. In 2015, Perkins was named by Equality Forum as one of their 31 Icons of the 2015 LGBT History Month. As the first female member of the presidential cabinet, Perkins had an unenviable challenge: she had to be as capable, as fearless, as tactful, as politically astute as the other Washington politicians, in order to make it possible for other women to be accepted into the halls of power after her. Perkins had a cool personality which held her aloof from the crowd. On one occasion, however, she engaged in some heated name-calling with Alfred P. Sloan, the chairman of the board at General Motors. During a punishing United Auto Workers strike, she phoned Sloan in the middle of the night and called him a scoundrel and a skunk for not meeting the union's demands. She said, "You don't deserve to be counted among decent men. You'll go to hell when you die." Sloan's late-night response was one of irate indignation. Her results indicate her great love of workers and lower-class groups, but her Boston upbringing held her back from mingling freely and exhibiting personal affection. She was well-suited for the high-level efforts to effect sweeping reforms, but never caught the public's eye or its affection. President Jimmy Carter renamed the headquarters of the U.S. Department of Labor in Washington, D.C. the Frances Perkins Building in 1980. Perkins' was honored with a postage stamp that same year. Her home in Washington from 1937 to 1940, and her Maine family home are both designated National Historic Landmarks. The Frances Perkins Center is a nonprofit organization located in Damariscotta, Maine. Its mission is to fulfill the legacy of Frances Perkins through educating visitors on her work and programs, and preserving the Perkins family homestead for future generations. The Center regularly hosts events and exhibitions for the public. Perkins remains a prominent alumna of Mount Holyoke College, whose Frances Perkins Program allows "women of non-traditional age" (i.e., age 24 or older) to complete a Bachelor of Arts degree. There are approximately 140 Frances Perkins scholars each year. In the 1987 American movie Dirty Dancing, the lead character Frances "Baby" Houseman reveals that she was named after Perkins. A mural depicting Perkins was displayed in the Maine Department of Labor headquarters, the native state of her parents. On March 23, 2011, Maine's Republican governor, Paul LePage, ordered the mural removed. A spokesperson for the governor said they received complaints about the mural from state business officials and from an anonymous fax charging that it was reminiscent of "communist North Korea where they use these murals to brainwash the masses". LePage also ordered that the names of seven conference rooms in the state department of labor be changed, including one named after Perkins. A lawsuit was filed in U.S. District Court seeking "to confirm the mural's current location, ensure that the artwork is adequately preserved, and ultimately to restore it to the Department of Labor's lobby in Augusta". As of January 2013, the mural resides at Maine State Museum, Maine State Library and Maine State Archives entrance. ^ Downey, Kirstin. The Woman Behind the New Deal, 2009, p. 337. ^ a b c d "Graduate of Hull House and Former Associate of Jane Addams, She's a Careful Student of Sociology". Evening Star. March 5, 1933. p. 9. ISSN 2331-9968. Retrieved December 24, 2018. ^ Corrigan, Maureen (April 16, 2009). "Frances Perkins, 'The Woman Behind the New Deal'". NPR. Retrieved December 24, 2018. ^ a b c d e Kennedy, Susan E. "Perkins, Frances". American National Biography Online. Oxford University Press, Feb. 2000. Web. March 27, 2013. ^ a b c d e f g h Breitman, Jessica. "Frances Perkins". FDR Presidential Library & Museum. Retrieved March 2, 2018. ^ Downey, Kristin. The Woman Behind the New Deal. Anchor Books, 2010, p. 11, p. 25. ^ "Cornell University - ILR School - The Triangle Factory Fire - Lecture by Frances Perkins". trianglefire.ilr.cornell.edu. Retrieved July 31, 2018. ^ a b c "Frances Perkins". aflcio.org. Retrieved December 24, 2018. ^ a b "Suffragette News". The Cairo bulletin. July 29, 1912. p. 2. ISSN 2381-3172. Retrieved December 26, 2018. ^ "Young Woman Expert Probing Fatal Fire". The Richmond palladium and sun-telegram. August 20, 1913. ISSN 2572-8911. Retrieved December 26, 2018. ^ a b Berg, Gordon (June 1989). "Labor Hall of Fame: Frances Perkins and the flowering of economic and social policies". www.findarticles.com. Archived from the original on April 18, 2005. Retrieved December 27, 2018. ^ Downey, Kirstin. The Woman Behind the New Deal, 2009, p. 2. ^ a b Karenna Gore Schiff (2005). Lighting the Way: Nine Women Who Changed Modern America. Miramax Books/Hyperion. ISBN 978-1-4013-5218-9. OCLC 62302578. ^ Downey, Kirstin. The Woman Behind the New Deal, 2009, p. 380. ^ "Frances Perkins House (U.S. National Park Service)". www.nps.gov. Retrieved January 5, 2019. ^ "Frances Perkins - U.S. Cabinet Member" (PDF). lgbthistorymonth.com. Retrieved January 5, 2019. ^ a b "Frances Perkins Opposed as Industrial Official". New-York tribune. January 16, 1919. p. 7. ISSN 1941-0646. Retrieved December 26, 2018. ^ a b c d "New York's New Citizen Makes Good as an Officeholder and Paves the Way for Future Appointments". New-York tribune. August 3, 1919. ISSN 1941-0646. Retrieved December 27, 2018. ^ Our History – New York State Department of Labor Archived March 12, 2012, at the Wayback Machine. Labor.ny.gov (March 25, 1911). Retrieved on 2013-08-12. ^ "125 Influential People and Ideas: Frances Perkins". Wharton Alumni Magazine. Wharton.upenn.edu. Spring 2007. Retrieved March 12, 2017. ^ Alexandra Starr (February 12, 2006). "Women Warriors". The New York Times. ^ Gibbons, Chip (September 2016). "The Trial(s) of Harry Bridges". Jacobin. Retrieved March 2, 2018. ^ a b "Future Cabinet Changes Cited". The Wilmington morning star. May 14, 1945. ISSN 0163-402X. Retrieved December 27, 2018. ^ a b Associated Press (June 30, 1945). "Four New Cabinet Members Take Oaths of Office Today". Evening star. ISSN 2331-9968. Retrieved December 27, 2018. ^ "Boys Will Be Boys". Evening Star. October 29, 1951. pp. A–2. ISSN 2331-9968. Retrieved December 27, 2018. ^ Cooper, Andrea (September 26, 2017). "American History Book Review: The Roosevelt I Knew". HistoryNet. Retrieved December 27, 2018. ^ Soderstrom, Carl; Soderstrom, Robert; Stevens, Chris; Burt, Andrew (2018). Forty Gavels: The Life of Reuben Soderstrom and the Illinois AFL-CIO. 3. Peoria, IL: CWS Publishing. p. 42. ISBN 978-0998257532. ^ "Discovering Frances Perkins". ILR School. February 24, 2009. Retrieved April 3, 2016. ^ "CAM Cover Story". Cornell Alumni Magazine.com (May 17, 1965). Retrieved on 2013-08-12. ^ "Labor Hall of Fame – Frances M. Perkins". U.S. Department of Labor. June 20, 2011. Retrieved September 5, 2016. ^ Pasachoff, Naomi (1999). Frances Perkins: Champion of the New Deal. Oxford: Oxford University Press. p. 147. ^ Malcolm Lazin (August 20, 2015). "Op-ed: Here Are the 31 Icons of 2015's Gay History Month". Advocate.com. Retrieved August 21, 2015. ^ The Tennessean, Arts & Entertainment, March 8, 2009, "The Woman Behind the New Deal" (Kirstin Downey). "Perkins ... not only had to do more than her male counterparts to prove herself, but she had to do it while dealing with rough-and-tumble labor leaders, a husband in and out of mental institutions, condescending bureaucrats and some Congress members hell-bent on impeaching her." p. 11. ^ Herman, Arthur. Freedom's Forge: How American Business Produced Victory in World War II, p. 68, Random House, New York, 2012. ISBN 978-1-4000-6964-4. ^ a b "Frances Perkins: Trailblazer for Workers' Rights". apwu.org. March 2006. Archived from the original on December 3, 2008. Retrieved March 3, 2019. ^ "List of NHLs by State". National Park Service. National Park Service. Retrieved March 2, 2019. ^ "Frances Perkins Program". Mount Holyoke College. Retrieved July 6, 2012. ^ Williams, Brenna. "#TBT: Frances Perkins, the first woman in the Cabinet". CNN. CNN. Retrieved March 2, 2019. ^ "Judy Taylor Fine Art Studio and Gallery, featuring Portraits, Landscape Art, Figurative Art, Still Life Art, and Great Master's Reproductions". Judytaylorstudio.com. Retrieved December 30, 2011. ^ a b Greenhouse, Steven (March 23, 2011). "Gov. Paul LePage Takes Aim at Mural to Maine's Workers". The New York Times. ^ "Fed. lawsuit filed over Maine labor mural removal", The Boston Globe, April 1, 2011. ^ "Labor mural flap cost state more than $6,000", Portland Press Herald, January 19, 2013. Downey, Kirstin. The Woman Behind the New Deal: The Life of Frances Perkins, FDR's Secretary of Labor and His Moral Conscience, New York: Nan A. Talese/Doubleday, 2009. ISBN 0-385-51365-8. Keller, Emily. Frances Perkins: First Woman Cabinet Member. Greensboro: Morgan Reynolds Publishing, 2006. ISBN 9781931798914. Severn, Bill. 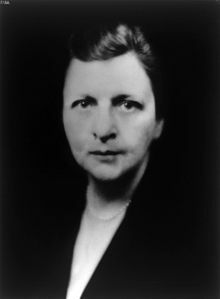 Frances Perkins: A Member of the Cabinet. New York: Hawthorn Books, Inc., 1976. ISBN 0-8015-2816-X. Wikimedia Commons has media related to Frances Perkins.